Thank you for taking a First Step in co-creating a global network of compassionate and empowered community builders. These beautiful Innate Essence Activators I call seed-keys contain sacred geometry and activations to assist you with feeling your most aligned purpose, more clarity of guidance and Infinite Wisdom, your loving sacred connection to Earth, all life, and the Cosmos. You are co-creating peaceful alchemical shifts on the planet! Our products assist you with a remembering of your loving communion with others, your Divinity, the Earth and the Cosmos, and the harmony that we know in our hearts is possible. They have the potential to create a greater sense of flow and peace within you, your family, and even your pets. You and humanity are all magnificent beings bringing heaven to Earth and within you through your compassionate actions and zest for life, expanding and co-creating a new reality. The benefit to each of you will likely vary, for your Presence, your experience, is unique to you and so will your awakening expansion that these products have the infinite potential for creating. Too Young To Wed is a nonprofit organization officially launched in October 2012, the first International Day of The Girl Child where dignitaries from around the world gathered at the UN, surrounded by photographs of child brides as young as 5. Journalist Stephanie Sinclair first experienced child marriage ten years before that, when covering a story in Afghanistan where women and girls set themselves on fire to free themselves of forced marriages when they were children. Too Young To Wed continues to partner with the UNFPA (Population Fund) and other organizations to not only advocate for an end to child marriage but also provide on-the-ground support to communities where the photos used in their traveling exhibitions were taken (by the girls themselves). The photos feature haunting stories of child brides from Nepal, India, Tanzania, Ethiopia, Yemen, Afghanistan and even the United States. Their first pilot project is a livelihood initiative in Bahir Dar, Ethiopia that employs women who have escaped child marriage and/or have been trafficked. By producing and selling high-quality soaps these women generate a sustainable income for themselves and their families. ... taken from TYTW website. http://tooyoungtowed.org/. The Rosie’s H.O.P.E. chest is an amazing tool to assist humanity to awaken to the loving, deeper core truths that reside within every cell (DNA) of our bodies. 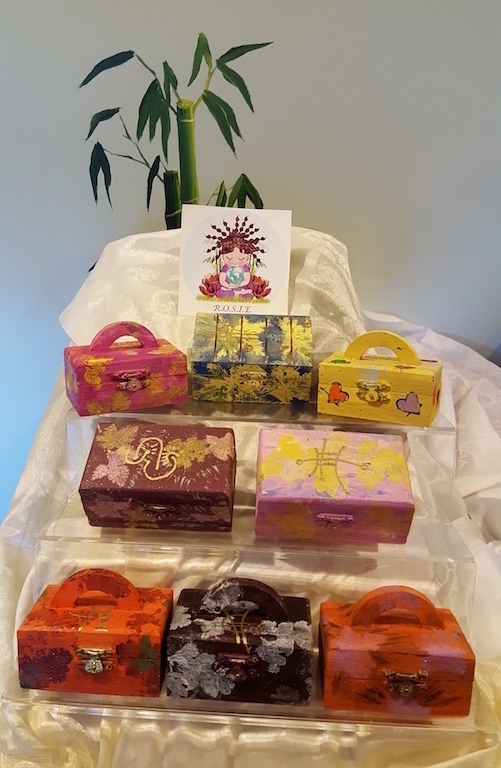 These little chests are a powerhouse of potential possibilities that are anchoring in new, loving energies coming from the cosmos and working with the Earth's grids to accelerate our consciousness. Working with Beloved Gaia the crystals and sacred symbols in the chests pull in energies from our star seed families and the compassionate actions of fellow humans. Gaia amplifies and helps radiate these new frequencies throughout the planet along the crystalline, magnetic and other grids. Because of our interconnectedness to the Earth we all get the upgrades, with as much grace and ease as possible. The Earth herself is assisted in her ascension as well. Read More... that acts like a beacon to the crystalline grids in the planet and as you embody your Innate Abilities including compassion, and integrating with your higher self, your compassionate feelings and actions strengthen, so too does the grid, and humanity over time. The original H.O.P.E. chests were called Star 4 Earth boxes and were buried in the ground to assist the Earth. These evolved into the Rosie’s HOPE (Humans’ Openhearted Peaceful Earth) chest, my second experience of Divine Guidance (Gaia’s Song my first) and I am so grateful to my friend C.L. who lovingly and patiently guided me on my beginning spiritual awakening path. Together we created the chest, putting all sorts of things to enhance its energy. I dowsed what crystals to include, what Reiki symbols to use on the copper and clay pieces, added some sand from my world travels and then to my delight a weed (Geranium robertianum) in my garden became the “creative” design on the outside. I play my recording of Gaia’s Song as I make the boxes, and as I do my piece of the puzzle is infused into each chest. I thought the chest was a gift for the Earth that as we lovingly sent prayers of compassion and love to her, family and friends, energy would be felt globally. New friends have come into my life who have also greatly assisted me on my journey. Now my understanding of the chest has evolved even more: to assist us in remembering and awakening to the deeper truth of who we are, divine beings of the Universe. The encodements within our DNA are awakening with the assistance of so many things, including the grids and Rosie’s H.O.P.E. Chests. Each letter has meaning: Remembering Our Spiritual Innate Expression Humans’ Openhearted Peaceful Earth. And of course thanks also to the sun’s solar flares and photon packages of light that also activate the grids and the chests. What a most amazing journey in consciousness and magic we are on. Initially I didn’t really understand what I was doing with either of these gifts, didn’t think I felt any of the energy but then I had no idea what my telomeres (link to glossary page) were or how powerful my old limiting beliefs were! Now I know how much I have been guided by the Gaian and the Rosie’s H.O.P.E. chest in part through the activations of the encodements in my DNA and the love of the Universe that has pushed and guided me these past couple of years. I am so grateful and blessed for all those who have assisted me, both seen and unseen. If you would like a particular style of box (A,B or C) or particular colour for background or leaves, please make a note on the contact page. I will add what inspires me as well. 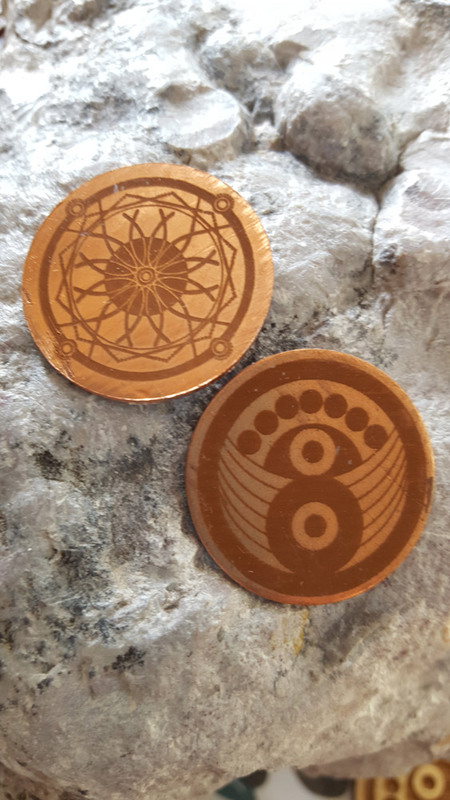 The copper gaian coin is the second Essence Activator, another amazing tool to accelerate your consciousness. The sacred geometry of the two images are activating dormant codes in our DNA to assist in our becoming more conscious beings leading us to more peace and harmony. We truly are beautiful, magnificent beings of light capable of so much more than we were ever told. Our innate knowingness, our intuitive sixth sense, our natural compassion is awaiting a signal from you! Innate Abilities We all have them but for many of us they are dormant or only a few are activated as special abilities, artistic or healing abilities. Science is showing us now how multidimensional our bodies are, including our DNA. All that junk DNA is actually information. 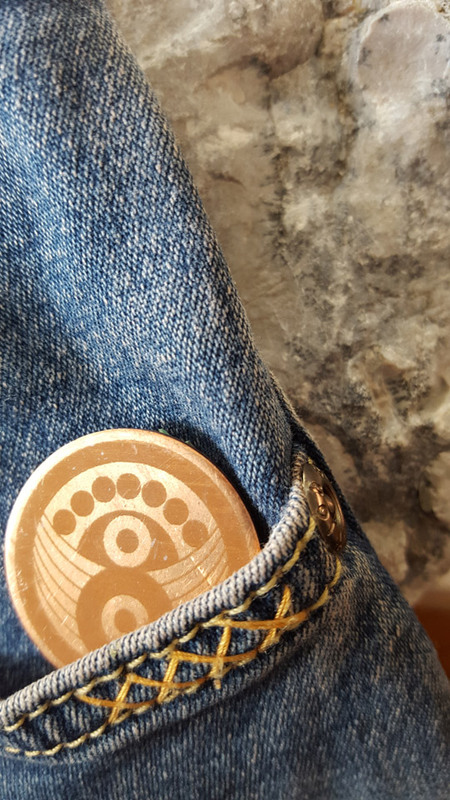 Some of the benefits of the Gaian coin to you and the Earth (in the soil, in your pocket or as a necklace) include a greater sense of peace, helps balance your chakras. For others, it awakens their heart’s calling, their purpose, bringing more congruence and guidance to their journey. They also assist the Earth on her journey of ascension – leading to a peaceful, harmonious family of humanity. The copper Gaian necklaces, fused glass pendants, silver pieces and bracelets are great tools to assist in accelerating your consciousness. Why? To be more of that loving, peace-full, joy-filled benevolent being you came here to be! It's time to align with your Soul Presence. Part of being present is that conscious awareness to that beautiful divine spirit that resides in every cell of your body, We have natural super powers waiting to be turned on! What that awakening experience will be is as unique as each individual human being. Some of the benefits experienced by others include a deeper connection to Creator Consciousness/Source/God, a greater feeling of harmony and joy within, a feeling of being home, of loving oneself and others much more easily. They also assist with being more receptive to the activations from the photon packages of light from the sun via our telomeres. Copper is a known conductor of energy and was used by ancient civilizations for its healing benefits; to clean their water and used in tinctures for treating various ailments. Recent research is proving scientifically what the ancients knew intuitively. Now, these tools with or without the copper will assist you and humanity, and also Mother Earth with the ascension process now underway on the planet. Exciting times are afoot!! 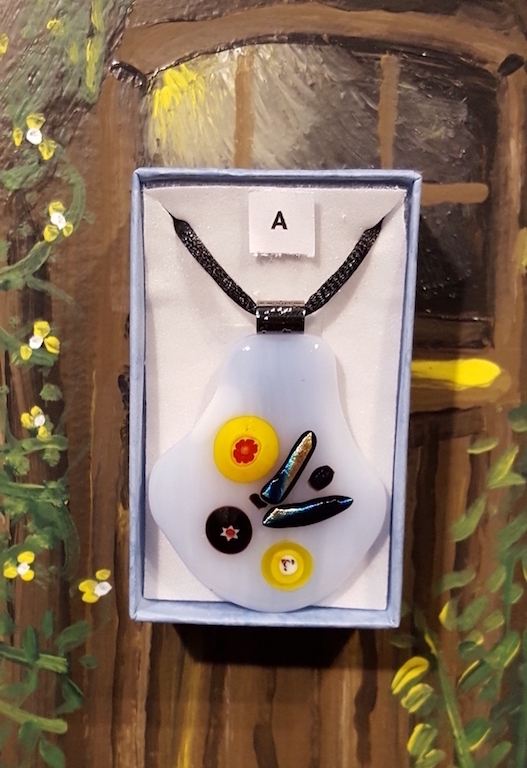 Each piece that I make is unique due to the nature of the glass fusing process, how the pieces are cut and the additional flourishes I add to each piece. On the back of each piece is the copper Gaian coin. Only the lasered pieces do not have the coin. In the example of the red pieces (there is also the challenge of getting an exact colour with my camera) all 3 were cut into the same shape yet each one came out slightly different. This means that the piece you purchase may not be exactly as the one illustrated. The photo with the 4 pieces was similar in shape prior to fusing in the microwave (yes!) but the final shape is very different. In the examples of the multiple glass pieces (3 boxes), these are one-of-a-kind because no two or sometimes three pieces of glass are exactly the same size or shape. When they are fused together each one is a surprise. 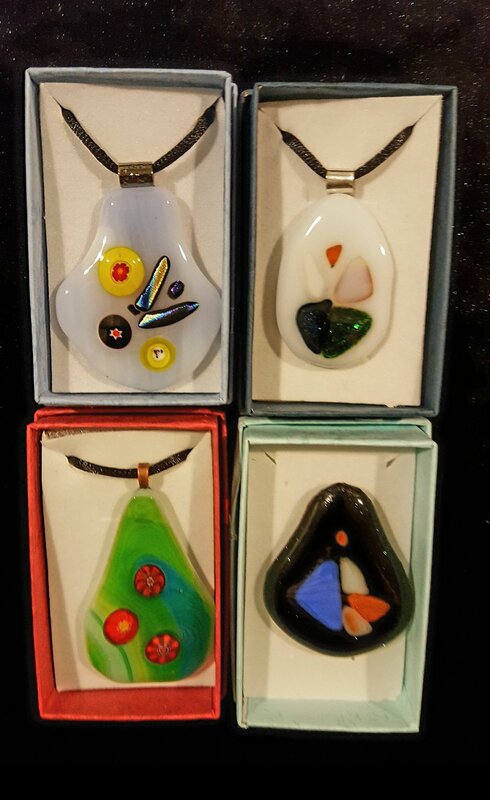 The third collection of pendants (4 boxes photo) are made with one base piece of glass and other smaller pieces I add are called millifiori (round) and/or dichroic glass (shiny pieces). This is my current collection for sale and once a piece is sold, there will not be another that is the same. I can make similar shapes and add similar add-ons but the new piece will be new and unique. The lasered pendants do not have flourishes or added pieces or copper coins. The measured frequency/energy of these is equal to the copper Gaian coins that are on the back of each pendant (a few have the coin on the front). Remember that these pieces are GLASS and are FRAGILE. They may crack if you let it knock against a sink or hard surface, and may break if dropped onto the floor (and shattered in the bathtub as I have done!!). For your size reference for the glass pieces, the boxes are 1 3/4”/4.2cm inside width and 3”/7.2cm long. Part of my daily practice is to connect with ROSIE, my Master pendant and Rosie’s HOPE chest, Mother Gaia and our Cosmic star family. Using my unique abilities, all pendants, chests, Gaians/bracelets and even the decals receive the higher frequencies of light, everywhere on the planet. You and I are activating the grids dear friends to a world of more Peace and Harmony, Understanding and Love. And so much more!!! whoohoo!!!! Please contact me with any questions and possible creations, including what is illustrated here. Loving assistance from the Earth elements copper and to some degree the gemstones are lighting up that multidimensional circuitry within you to activate those dormant codes in your energy fields of your DNA. The language frequency created by the sacred geometry within the two designs is like a cosmic phone call to your energy field: time to embody those deeper truths and skill-sets! These bracelets are made with a variety of gemstones, connector trays (copper, antique bronze, slate coloured brass) and a few have glass connector trays. My wrist is 17 cm/ 6 3/4” around and my fist is 25.5 cm/10”: this is a Medium. My husbands write is 19 cm/11 1/4” round and fist is 29 cm: this is a Large. A Small would be for those with small wrists. The nature of copper is one of change due to the oxidation process. The copper Gaian starts out shiny but over time it will lose that shine and become darker, as you may notice in some of the bracelets. If desired, coating with nail polish will maintain the shiny surface.